Between 1512 and 1516, the artists Niclaus of Haguenau (for the sculpted portion) and Grünewald (for the painted panels) created this celebrated altarpiece for the Antonite order’s monastic complex at Isenheim, a village about 15 miles south of Colmar. This polyptych, which decorated the high altar of the monastery hospital’s chapel until the French Revolution, was commissioned by Guy Guers, who served as the institution’s preceptor from 1490 to 1516. Established around 1300, the Isenheim monastery belonged to Saint Anthony’s order, which had been founded in the Dauphiné region of France in the 11th century. The monks of the Antonite order ministered to victims of Saint Anthony’s fire, a horrible illness that was common in the Middle Ages. This calamity’s cause is now known to be poisoning from a fungus (ergot) that grows on rye grass, thus contaminating the rye flour used in making bread. Ergot contains a chemical that drives its victims mad and results in gangrene of the hands and feet due to constriction in blood flow to the extremities. To care for the sick, the Antonites served them good quality bread and had them drink a concoction called saint vinage, a holy fortified wine, in which the monks had first macerated a special blend of herbs and then soaked the relics of Saint Anthony. They also produced a salve from herbs possessing anti-inflammatory properties. 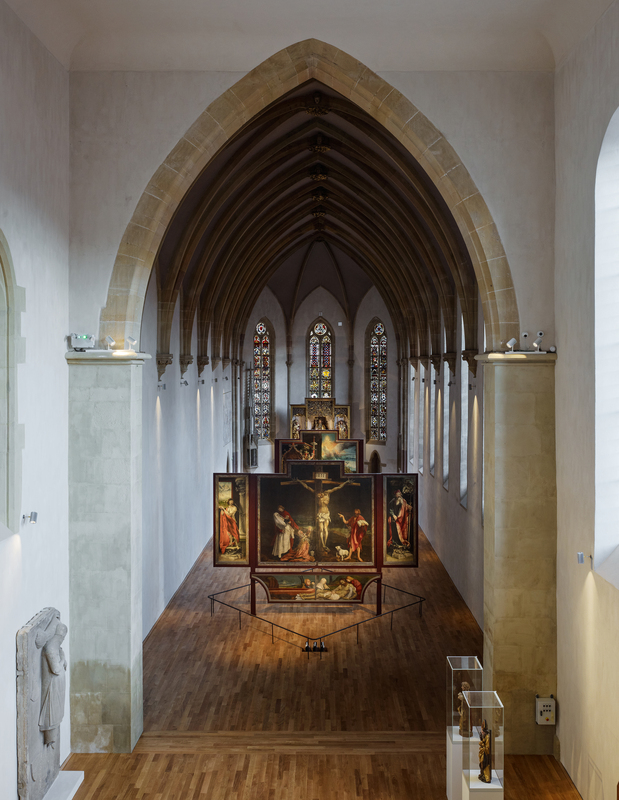 Little by little, the monks at Isenheim acquired a rich collection of works of art commissioned and financed by the monastery, one of which was this altarpiece. Held at this religious institution until the Revolution, it was transferred to the local branch of the French national library in 1792 for safekeeping. In 1852 it was moved to the chapel of the former Dominican convent known as the Unterlinden in Colmar, becoming the principal treasure of the museum being established at that time and has never ceased to captivate and enthral visitors since.